Merkel's Fragile Coalition Teeters On Edge Of Migration Question The German chancellor hopes to find some answers to that question at a European Union summit beginning Thursday. The parties she counts as allies have been deeply divided over how to treat newcomers. Germany's Chancellor Angela Merkel speaks with other Europen Union leaders during a summit Thursday in Brussels. 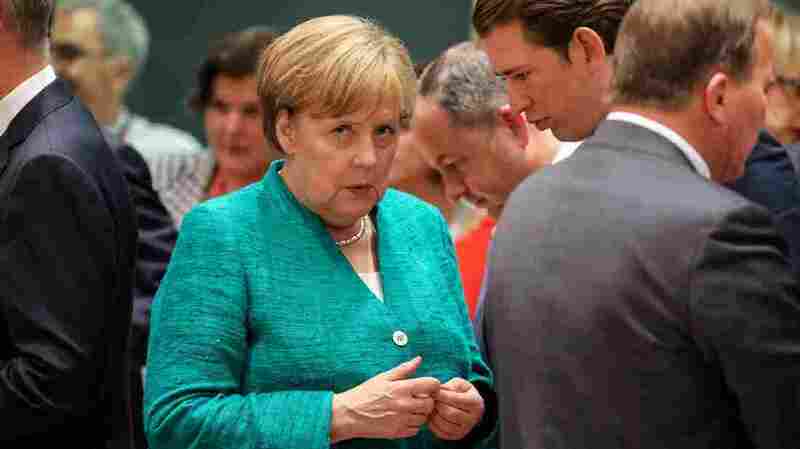 Earlier in the day she delivered a speech to a restive German parliament, deeply divided over matters of migration. Finally, after long stretches of heckling, she stopped speaking, took a deep breath and exclaimed in German: "My God, really?" The issue motivating the hecklers — who are part of the far-right Alternative for Germany party, or AfD — is the same one that's causing disputes between Merkel and her EU counterparts behind doors: migration to the 28-member bloc from the Balkans, Africa or the Middle East. The number of migrants entering the EU is down significantly from where it stood three years ago. Germany, for instance, saw a 70 percent drop in asylum applications last year, according to EU regulators. At the same time, more member countries are demanding that migrants who don't have visas be barred from entry. Proponents of the border closure say whether people are fleeing war, oppression or poverty shouldn't matter. They insist the problem needs to be addressed in the countries those people come from, and claim that the roughly 1.4 million mostly Muslim migrants who have come since 2015 are threatening Europe's cultural and religious identity. Hungarian Prime Minister Viktor Orban has been especially aggressive with that narrative, referring to the migrants time and again as an "invasion." Never mind that Hungary for months has only allowed two asylum seekers in per day through its heavily fortified and guarded border fences. "I think in order to restore the European democracy we have to move in that direction," he told reporters at the summit, speaking in English, which he rarely does publicly. "Finally we will you do what the people really request." He and other leaders in the EU also don't agree on who ought to be responsible for the newcomers: the border states where most migrants enter the bloc, the richer countries such as Germany, or a larger group of member states in order to lessen the burden on the EU border states that carry the brunt now. Merkel and her backers, including French President Emmanuel Macron and EU Council President Donald Tusk, say ultimatums and unilateral actions will only weaken the European Union and not solve the problem. Instead, they say their counterparts should focus on what they do agree upon — like the need for more secure external borders for the bloc and more control over migration to the EU. They suggest creating bilateral or trilateral deals to enforce points they agree on. "The alternative to this solution would be a chaotically advancing closure of borders ... as well as growing conflicts among EU member states," Tusk said. "Some may think I am too tough in my proposals on migrations, but trust me, if we don't agree on them, you will see some really tough proposals from some really tough guys." Horst Seehofer, German interior minister and CSU party leader, looks on at a weekly cabinet meeting in Berlin on Wednesday. Merkel was equally dire in her speech to the German parliament, saying the EU's fate depends on whether member states stick to or abandon their core values when dealing with migration. If bloc countries unilaterally close borders or fail to address the reasons why migrants are coming to the EU in the first place, "no one will believe anymore in the our value system that made us so strong." Her own fate hangs in the balance, as well. Fearing a challenge by the AfD in state elections in October, her Bavarian allies, the Christian Social Union, are threatening to quit her government over migration. And Horst Seehofer, the party's leader and Merkel's interior minister, has laid down an ultimatum to the chancellor: Either return from the EU summit with an acceptable migration deal in hand, or he will use his authority to unilaterally close Germany's border to many migrants as early as July 1. Such a confrontation would likely end in his ouster — which, in turn, would could prompt the rest of his party to quit. 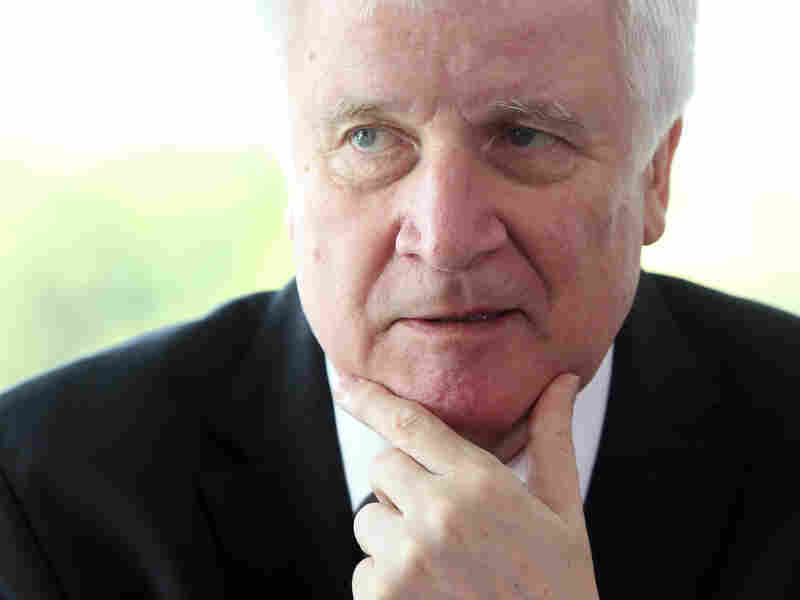 But it's a confrontation Seehofer says he'd prefer not to have. He told a German broadcaster Wednesday that no one in his party wants "to jeopardize the government in Berlin, dissolve the parliamentary alliance ... or unseat the chancellor" — though he added that her administration must demonstrate to the country that it "had everything under control." Merkel's conundrum cannot be solved by something so simple as placating the CSU on her right flank — for her other major party in the governing coalition, the center-left Social Democrats, would object to many of Seehofer's more hard-line proposals. The party, known by the initials SPD, was reluctant to join the coalition in the first place — so reluctant that it took months of political wrangling, and some pretty hefty incentives, to bring them into the fold. And the SPD remains much more open to admitting asylum seekers and immigrants more broadly than their right-wing counterparts in the coalition. All this to say: Her two days in Brussels promise to have an outsize impact on the weeks to come in Berlin — a notion she emphasized during her speech to parliament Thursday. "Europe has many challenges," she said, "but migration could end up determining Europe's fate."